Full Vapor ™ ~ E-Cigarette Reviews, Ratings & News! : Vapor Couture Halloween Sale - 20% Off Storewide! Vapor Couture Halloween Sale - 20% Off Storewide! 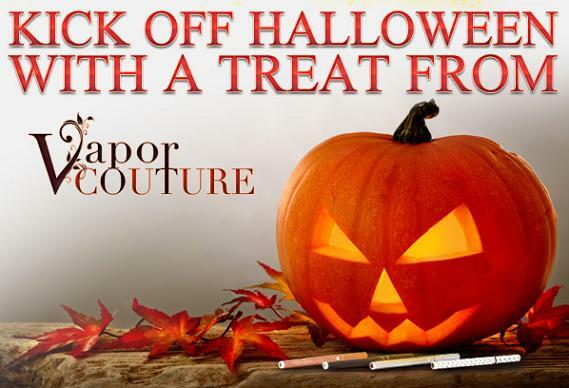 Vapor Couture is having a special 2-day Halloween sale this year. And this Halloween sale will get you full 20% off everything, storewide! As noted above, the special 2-day Halloween sale takes place on Oct. 30th and ends on Oct. 31st. You'll get 20% of everything at Vapor Couture: starter kits, cartridges, batteries, accessories, etc. Note: Vapor Couture is one of our all-time favorites (see our Vapor Couture review). They've got some really awesome starter kits, and offer some of the most stylish e-cigarettes out there today. Their crystal-tipped e-cigs are nothing short of stunning! And to top it off, they offer a full Lifetime Warranty on all their products. Vapor Couture is owned by V2 Cigs, so you can be damn sure that you're getting a top-quality product that rocks. So check them out today, and be sure to stop by and take advantage of the savings they're offering during their Halloween sale. Get An Additional 10% Off! The "fullvapor" coupon code would normally save you 10% on all Vapor Couture purchases...but in this case, it'll save you a whopping 30% on anything and everything. V2 Cigs Halloween Sale - 20% Off Storewide! V2 Cigs Free Shipping Special Offer! LiquiMax Blank Cartridges - Reviews Are In! V2 Cigs Sale - 40% Off V2 Cigs Items!